"A key part of BBCi's mission has always been to offer a trusted guide to the Web. Over the years we've helped thousands of people to use the Internet through our WebWise training and through our WebGuide to the best sites on the Web. Now, with 80 per cent of those asked believing that current search engines could be better, according to a recent NOP survey, BBCi is developing its role as a trusted guide by launching BBCi Search - a unique facility that draws upon the BBC's unrivalled editorial expertise and reputation as the UK's most trusted online brand – to enable users to get what they want from the Net, free from commercial pressures and safe from undesirable sites. By making it easier for users to find what they want, the BBC hopes to increase users' enjoyment of the web and encourage more people to spend time online, driving digital take up, in line with the BBC's existing strategy." That was how the BBC's Press office launched BBCi web search in 2002. Earlier this year, the BBC announced via their Internet Blog that they were withdrawing the facility to 'search the web' from the BBC site. 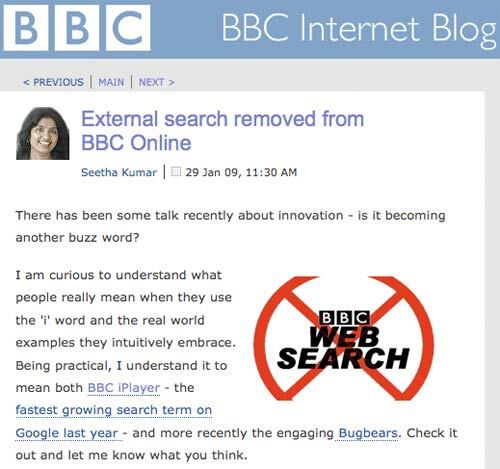 Search was something I worked on at the BBC from 2000 until 2003, and so I thought it might be an appropriate time to look back at the development, and demise, of the BBC as a place to search the wider Internet. The BBC first soft-launched a web search service as an additional fourth tab on the 'lilac' results pages. 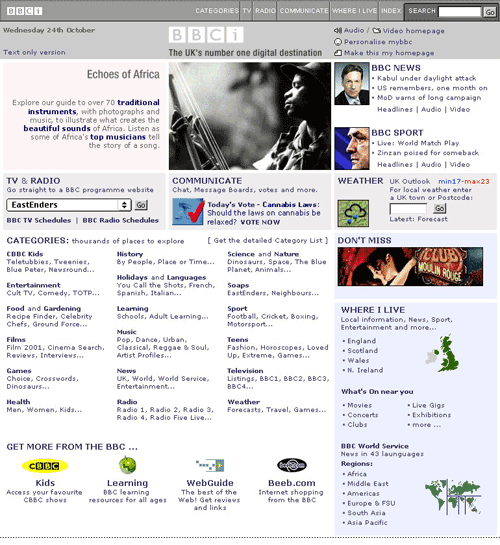 This version of search had been launched as part of the re-branding exercise in November 2001 that ditched the familiar "BBC Online" moniker in favour of BBCi. This unified the BBC's web, mobile and interactive TV content under one brand. An important part of the re-branding was the addition of a grey 'toolbar' above all content pages on the BBC site, and this toolbar included a universal search box. This was a significant development, as up until that point there had been no consistent entry point to search on the BBC site. The 1999 homepage design included a clearly sign-posted search box at the top right-hand corner of the page, but other search boxes appeared on the site in a haphazard fashion. The BBC used the Muscat search engine to maintain several indexes of pages belonging to silos of content. It was possible, for example, to search over the content of the Today programme, using a search box on the Today homepage, but this was in total isolation of the rest of the BBC's site. The unified search launched in 2001 went through some rapid iterative user-testing with Flow Interactive in North London. One thing that stands out now, looking back through the reports, is that the majority of the usability findings in 2001 remain the same usability issues for most site searches today. Confident users expect functionality that allows them to really narrow their results down, whilst novice users are easily overwhelmed by having too many options. And everybody expects search to read their minds. 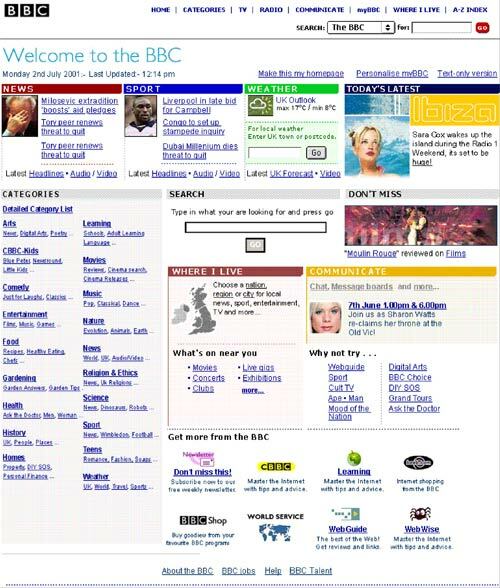 The 2001 tests started by using a version of the BBC homepage that was under development, and some rough mock-ups of the search design direction. It is interesting to note that the 'Were you looking for...' section was initially intended to include a mix of BBC and world wide web content for any search where there were editorial recommendations. Another point of note is that the 'toolbar' at the top of the page was at this point designed to allow immediate access to the different 'scopes' via a drop-down. 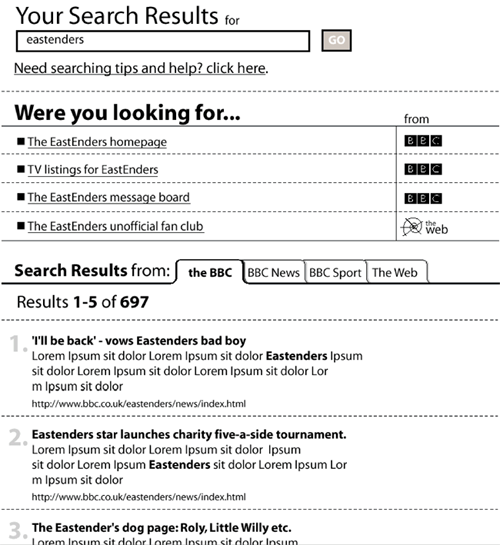 Indeed, it was this version of search that introduced to the BBC the idea of 'scoped' searches, selected by tabs. If a user was in a part of the site that had its own individual index, for example bbc.co.uk/radio1, then searching from the toolbar would produce results from just that area of the site. 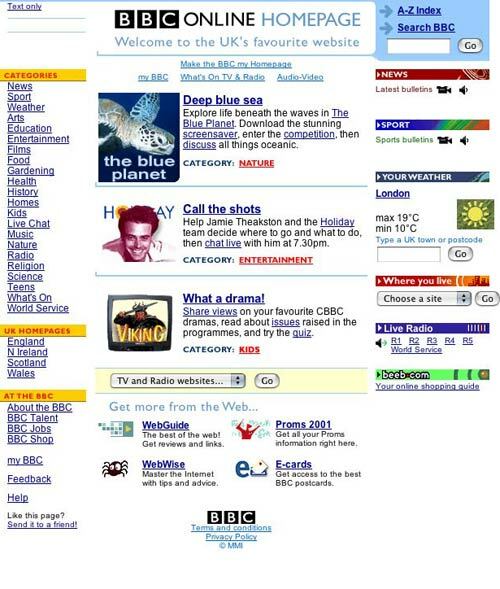 The user was given options, via tabs, to expand the search to 'All of the BBC', 'BBC News and Sport' or 'The Web', but the initial result set would only have content from Radio One. You can also get an overview of this design process from a presentation Matt Jones gave at the 3rd Annual ASIST Information Architecture Summit in Baltimore in 2002. View more presentations from Matt Jones. In the second part of this series, I'll be looking at the next two stages of iterative testing carried out on search in 2001 by the BBC. By Martin Belam on 25 March 2009. Good overview, though it seems horribly familiar. Didn't you cover the history of BBC search aaaages ago? Yes, in late 2007, I did a two part blog post for the BBC Internet Blog. I like to think of this as the expanded retrospective box-set to draw the whole chapter to a close now that I've moved to The Guardian. I've unzipped a lot of material that had been lying archived on my PC at home for the last few years, and I'll be putting up some screenshots and presentations which haven't been seen in public for some time. I also have a lot more readers of the blog now than I ever did back in 2003 when I was blogging about search as I went along, so hopefully it won't be overly familiar to everyone - but apologies in advance for those of you who find it to be too much of a re-hash. You've still got the Flow usability test reports. How wonderful! They could probably just be rehashed and reused too.